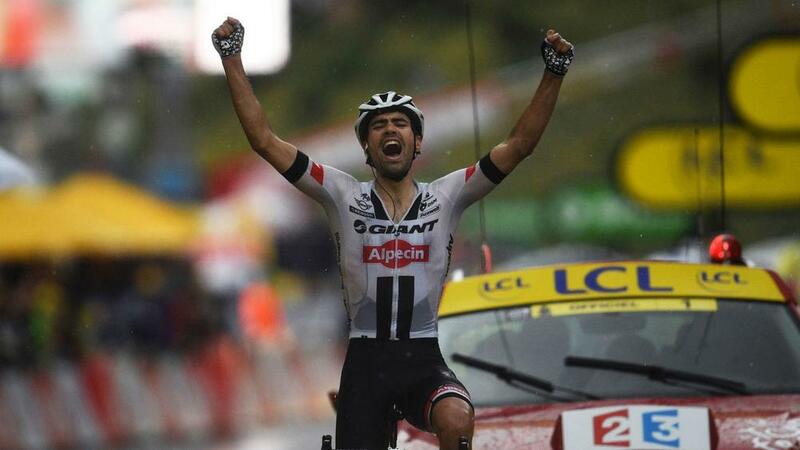 Tom Dumoulin bided his time before launching an unassailable attack on the final climb to take victory on stage nine of the 2016 Tour de France. The Giant – Alpecin rider was part of the breakaway group as the peloton made their way from Vielha Val d'Aran, the Dutchman surging clear on Andorre Arcalis. He quickly opened up a 30-second cushion before doubling it with eight kilometres to ride, Dumoulin maintaining his advantage as he crossed the line in Andorra. Rui Costa (Lampre – Merida) and Rafal Majka (Tinkoff) tried to reel the 25-year-old in, but his break was timed to perfection, sealing his first stage win at the Tour. Overall leader Chris Froome (Team Sky) had a much quieter day than 24 hours earlier as he stayed safely in the peloton, before testing his rivals with a late surge that helped maintain his 16-second lead. A group of 25 riders made the early pace and began to open up a lead over the peloton, but it was too much for Alberto Contador (Tinkoff). The Spaniard has been in the wars in the opening week of the Tour and after feeling ill prior to the stage, he abandoned with 100km to race. Majka, Thibaut Pinot (FDJ) and Thomas De Gendt (Lotto-Soudal) were prominent at the front of the lead group and the Frenchman found an extra spurt to take the 'King of the Mountains' points atop Port de la Bonaigua – moving him into the virtual lead. As Team Sky powered the peloton for overall leader Froome, the lead group were battling for mountains points, and De Gendt edged the next two ahead of Pinot, Majka and Diego Rosa (Astana). Pinot – who is the new mountains leader – earned top points on the penultimate ascent as the leaders enjoyed a nine-minute cushion. However with the only summit finish ahead of them the pain began to take its toll – the lead group beginning to thin out. De Gendt was one of those dropped and Dumoulin's late break also ended Pinot's chances, leaving Rui Costa and Majka to round off the top three. Further back the peloton maintained a watching brief for much of the day, before Froome injected some pace into proceedings on the final climb – dragging Movistar's Nairo Quintana with him. The move saw Fabio Aru (Astana) dropped, but failed to increase Froome's overall advantage from Adam Yates (Orica-BikeExchange) ahead of the first rest day on Monday.